I was born in Chicago in 1975. 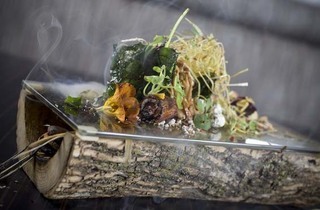 Grant Achatz was born in Michigan in 1974. This puts me in the sweet spot for maximum enjoyment of the current Next iteration, which is designed to evoke the Midwest in 1985—the pinnacle of our childhood (Achatz’s and mine, that is). As the Star Wars soundtrack played, my elated 10-year-old self dug into a Cabbage Patch Kids lunch box complete with Strawberry Shortcake thermos (filled with a sweet berry booze); a much-less-salty take on a Funyun; and a Fruit-Roll-Up–like apple-brandy leather. Meanwhile, my Millennial companion stared at her Poochie thermos in confusion, much like the seniors next to us, who seemed perplexed throughout the meal. But the joy of dumping sweet-tart Pixy Stix powder down your throat and chasing it with a bubble-gum ice cream float knows no age bounds. 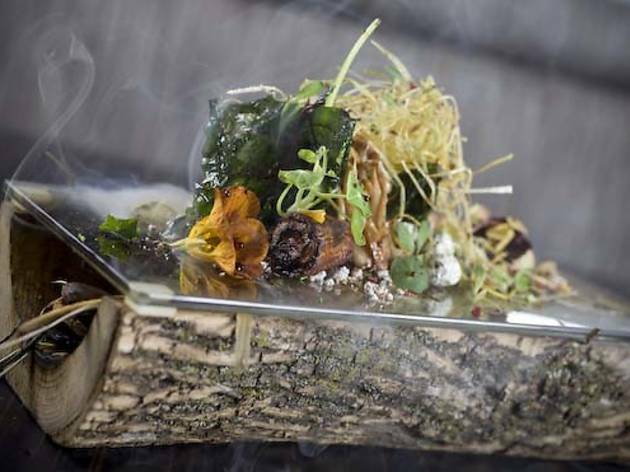 Nor do you need to be a ’70s child (co-chef Dave Beran isn’t) to have your mind blown by the Autumn Scene course, half a hollowed-out log filled with smoking aromatics and topped with glass upon which carrots, fried leeks, mushrooms and broccoli are fashioned to look like the forest floor. As for the PB&J amuse and the deconstructed hamburger that you drag across ketchup, mustard emulsion, hamburger-bun sauce (better than it sounds) and dehydrated garnishes, both tasted better than my 10-year-old self remembered. This was not true of all the dishes, of course. But nearly every dish dredged up more long-forgotten childhood memories than a therapy session. Happier ones, anyway.